For those of you who didn’t know I co-host a podcast, hey there, I co-host a podcast. It’s called China Hang-up and it focuses on a lot of the same Chinese sociopolitical and economic themes I cover on this blog. Just wanted to announce that we’ve moved to a new home at Project Pengyou. Since I first announced the podcast here in 2012, it’s morphed into more of a round-table discussion on issues of interest to young China watchers. Our inaugural episode with Project Pengyou looks at one of my favorite topics: the political mindset of Chinese youth today. I’ve said before that it would be a fool’s errand to try and gauge something like this among such a large diverse population, so naturally we’ve stepped up to take on that errand. Helping us do so is someone far less foolish than ourselves: Beijing-based post-80s journalist Helen Gao. We look at how the political education system has changed since Tiananmen and whether an apparent uptick in youth-led demonstrations in recent years indicates the stirrings of a political re-awakening. 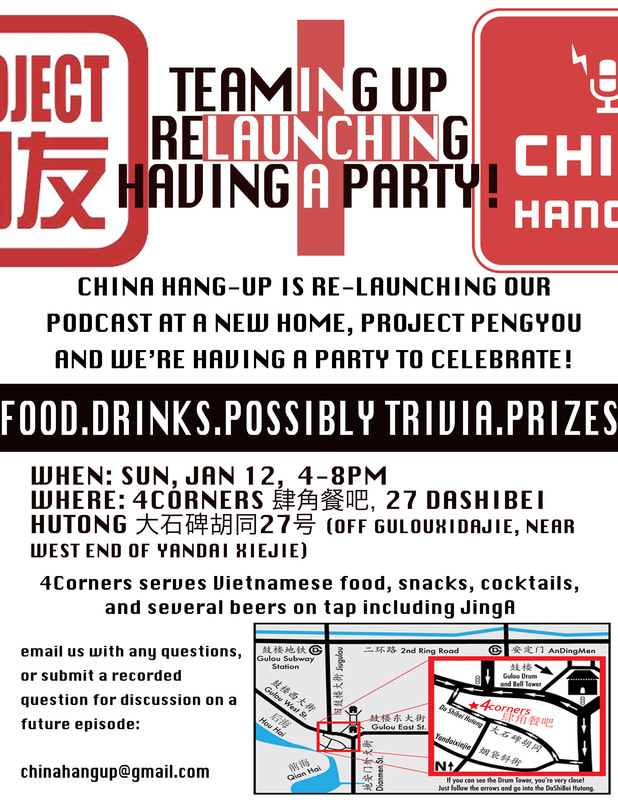 For anyone in Beijing, we’re having a re-launch party to celebrate the new partnership this coming Sunday evening at 4corners. We’re hoping it’ll be a good chance for China hands – young and old – from around the city to rub elbows over drinks. Hope to see some of you there. On separate note, I’m knee-deep in the later stages of a project I’ve been working on for the past year-and-a-half, which is why updates here have been (and will likely continue to be) sparse. But we still plan to put out a podcast every two weeks, so I hope you’ll check that out instead.